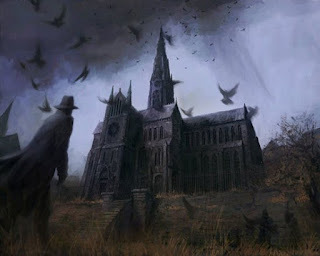 "I have seen the dark universe yawning"
In Providence, Rhode Island, Robert Blake, a young writer with an interest in the occult, becomes fascinated by a large disused church on Federal Hill which he can see from his lodgings on the city's Upper East side. His researches reveal that the church has a sinister history involving a cult called the Church of Starry Wisdom and is dreaded by the local migrant inhabitants as being haunted by a primeval evil. The being can only go abroad in darkness, and is hence constrained to the tower at night by the presence of the lights of the city. However, when the city electric power is weakened during a thunderstorm, the local people are terrified by the sounds coming from the church. "I see it-- coming here-- hell-wind-- titan-blur-- black wings-- Yog-Sothoth save me-- the three-lobed burning eye..."